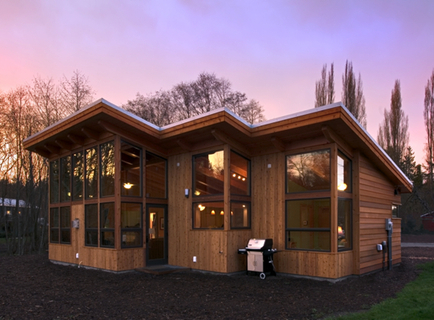 TimberCab homes feature Douglas Fir timberframes as well as our highest level of finish. Our timberframes and wall/roof panels are pre-cut with state of the art technology and labeled for an efficient build at the site by a licensed contractor. We can ship to most building sites due to the flexibility of our home packages. Download our TimberCab Introduction Packet and learn about the materials and finishes we offer. To learn more about our featured models, click on a rendering thumbnail below. Please contact us if you are interested in custom floor plans. priced ~$350+ per sq. ft. The TimberCab 550 is one of our most versatile designs! It meets the backyard cottage/accessory dwelling unit (ADU) size requirements in most jurisdictions while it is also ideal as a compact getaway cabin. You will be surprised at how large the space feels partially due to the open floor plan, high ceilings and flexible space. This design offers a full-kitchen and bathroom with a walk-in, curbless shower. Loft space above the bathroom can be utilized as storage. The efficient TimberCab 848 model makes a perfect getaway cabin. With its open plan, cathedral ceilings, and flexible spaces, the 848 retains the spacious feeling of the 550 with an extra bedroom, additional storage, and a larger kitchen. The luxurious bathroom includes a walk-in, curbless shower. priced ~$325+ per sq. ft. The TimberCab 1029 model’s expanded two bedroom layout offers extra-large living space with plenty of room for entertaining, relaxing, or even working. Cathedral ceilings and a spacious bathroom complete this small home. The TimberCab 1337, a great primary home or larger vacation house, has three comfortable bedrooms and two generous bathrooms — each with curbless showers. A flexible room off the main living space can be used as a bedroom, dining room, or workspace. High ceilings extend throughout the house. Please visit our TimberCab Home Package Guide for details, photos and options about our products and materials below. FabCab homes are designed with high-quality and eco-friendly products and materials, and incorporate Universal Design principles at every opportunity. Note: Home Package pricing does not include shipping or any applicable sales tax. Note: Construction estimate pricing is based on Pacific NW labor rates and easily accessible flat land. Pricing does not include shipping or any applicable sales tax, and should be considered a starting point for budgetary purposes only.